I rarely get super personal on here, just because I want The Style Scribe to remain a light, fun place for you to be inspired and get insight into the things that you love – whether that’s style, travel, beauty, or whatever. Today however, I’m mixing things up! If you’ve been a longtime follower of the blog (it’s been nearly 5 years since I launched this baby! ), you probably noticed my weight has fluctuated quite a bit. It’s certainly not something I intended to happen! When I first started my blog, I was definitely under what I should have weighed at 5’9 – I was hovering around 125 lbs. See here for an example. At the time, I was still on the ADHD medication that I’d been taking since grade school. Focusing was something that was very difficult for me as a child (ask anyone I know), and I continued to need that medicine all the way through college. After I started the blog and began working at a job that I loved a few years out of school (looking at you, rewardStyle! ), I realized I no longer needed that extra push from the medicine to get me to focus because I was so interested in what I was doing. Getting off the medicine is where the trouble started. If you know anything about ADHD/ADD medication, you’ve probably heard it suppresses your appetite. Because my appetite was nearly non-existent, I could eat whatever I wanted (but only ate once a day). Not so good for the metabolism. When I moved to Dallas and got off those meds, my appetite was back with a vengeance! Unfortunately I hadn’t really thought it through, and instead of eating healthy meals to compensate for eating more throughout the day, I just ate whatever I wanted three times a day (and snacks!). That led to me gaining 30 pounds in about a year. Working out has never been my favorite activity, but it’s always been something I’ve fit into my schedule. Even when I was working at rewardStyle and the blog at all hours of the day and night, I still managed to fit in spin class or some form of exercise early in the morning (5am, usually). I figured that if I could maintain working out (and work out harder), I could still eat whatever I damn well please. Well folks, that just didn’t work for me. After struggling for almost two years with various workout routines, juice cleanses, and short-term diets to get me back on track, I finally found a way to get the weight off. You’re probably not going to like what I’m about to say, but I did it the old fashioned way. When I returned from my trip to London in October, I decided it was time to put my foot down and really commit to eating healthier. I’ve completely cut out processed foods, dairy, complex carbs and most animal fats. I also try to restrict any drinking to the weekend. My diet consists mainly of vegetables (raw, roasted, grilled, or otherwise prepared – i.e. salads), fruit, a variety of nuts (I LOVE cashews! ), and the occasional lean meat. Every once in awhile I’ll take a day or two off for special occasions (hello, vacation!) or if I’m really feeling like I need a cheat day – I’ll let myself order that sinful grilled cheese and tomato basil soup, or have an extra glass of wine (or two). But mostly, I stick to this rhythm. Because I’m sure you’re thinking, SHE’S CRAZY!, I wanted to share some of my favorite healthy recipes and snacks that I love to eat/make at home that are both super easy to prepare and really, really delicious. If I’m working out in the morning, I mix up a scoop of this Vega Protein Powder in Choc-A-Lot with water or almond milk (get it at Whole Foods, Central Market, or HEB). It’s purely vegetable protein (19 grams per serving!) and only 90 calories. Depending on how rigorous my workout is, sometimes I’ll throw it in a blender with a banana, some almond butter and ice for a yummy smoothie. If working out is not on the agenda, I love to whip up egg whites with some cheese, and eat them with fresh berries or another fruit. I eat fruit a lot (I have a major sweet tooth), so sometimes I’ll just make a fruit salad with seasonal options. Just depends on my mood! Kale Salad – I’ve made this salad a lot this summer. It’s refreshing and full of flavor! I’ve added and removed ingredients depending on what I have at the house and what sounds good to me. For example, more times than not I don’t include the goat cheese because it’s pretty caloric, but if I’m feeling famished, I use it. I also prefer to use dried cherries instead of cranberries, and I remove the radishes (not a fan). PS – the dressing in this recipe is FANTASTIC! It’s perfect for drizzling over any salad that contains fruit. Spiralized Zucchini & Yellow Squash – this one is fun to make and takes zero time. I picked up this spiralizer at Sur La Table (only $25!) earlier this spring and have been using it like crazy! After spiral slicing my desired amount of zucchini and/or squash, I sauté them in a pan with just a dab of olive oil for 1-2 minutes. Don’t wait too long, or they’ll get soggy! Most of the time I just sprinkle with salt and some parmesan cheese. Roasted Cauliflower Marinara “Pasta” – this one takes a little longer to make, but it’s the thing I make the most. I posted the recipe here. I make this recipe at least twice a week when I’m home! My fave! PS – this is my favorite marinara sauce to use. You can find it at Whole Foods or Central Market! SO GOOD! Mixed Roasted Veggies – to break it up so I’m not just eating cauliflower every day, I like to buy a selection of mixed veggies and roasted them all together. 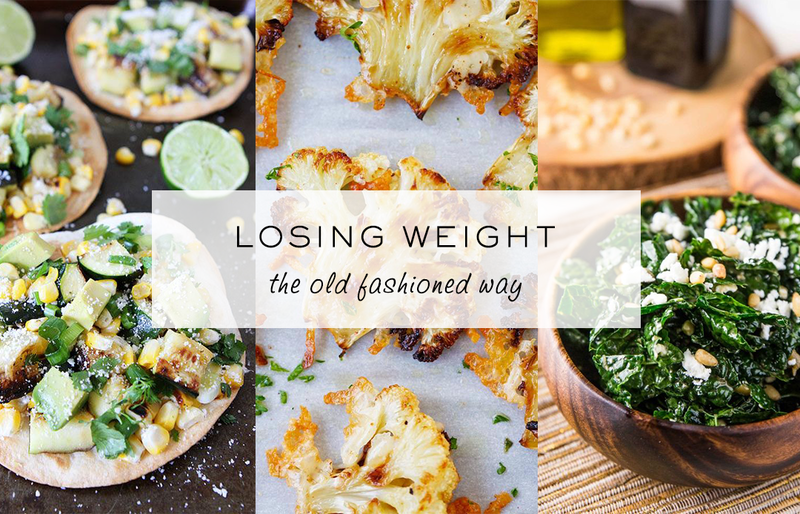 My favorite mix includes tomatoes, mushrooms, onions, brussel sprouts, zucchini, yellow squash and… cauliflower. Chop it all up, toss in olive oil, then roast at 400 degrees for 30 minutes, stirring halfway through. When it’s done, I just sprinkle some parmesan cheese on it! Avocado and Tomato Salad – this is another simple recipe that’s also easy to modify. Consider it a lighter caprese. Sliced up one large tomato and half an avocado, and sprinkle with salt, pepper and red pepper flakes. If you need/want more than that, try adding a few slices of turkey or grilled chicken (instead of that burrata that popped into your head). Spaghetti Squash – this one takes a little more effort, but is so good! Take a whole spaghetti squash, wash it, and then poke 5-10 times with either a fork, skewer or a knife. Cook it in the microwave on high for 10-12 minutes, rotating it and turning it over every few minutes or so to cook evenly. Once the outside of the squash feels soft to the touch, remove it (carefully – it’ll be super hot! ), and set aside for a few minutes to cool down just a tad. While it cools, prepare marinara sauce. You can use whatever sauce you like (I love Cucina Antica! ), or create your own by sautéing tomatoes, garlic, onions, olive oil, salt and pepper for 5-10, stirring constantly. Once the sauce is ready, remove from heat. Now cut the spaghetti squash in half (long ways), and scoop out the seeds. Once you’ve done that, grab a fork and scrape the inside of the squash to get those “spaghetti” strands. Place them right into a bowl and top with marinara! A few snacks I like to eat throughout the day include apples (I love HoneyCrisp! ), popcorn (check out LiveLovePop! and 479 Popcorn), fresh pineapple, cut-up zucchini with light ranch dressing, watermelon, half an avocado sprinkled with salt/pepper/red pepper flakes, cherries, and jalapeno cashews (I believe they are by AustiNuts?). A few of these fruits work for dessert too, but I love popsicles. All throughout the year. I love the basic coconut ones you can just buy at Whole Foods or Central Market. The GoodPops brand is also really yummy – particularly the Banana Cinnamon, Chocolate Milk and Coldbrew coffee flavors. Also, if I’m craving something creamy, I’ll take blend 1 1/2 frozen bananas and some almond butter together. So yum! To summarize, I’m just cutting out the bad stuff. People are always talking about it, but it took me a while to talk myself into actually doing it – it’s just something you’ve got to decide for yourself! At first it’s pretty difficult, but once the bad stuff is out of your house and you’re not buying it all the time, you stop thinking about it and craving it. I’d still like to lose another 7-10 pounds, and as I’m sure you know, those last pounds are the most difficult to shed. The benefits of cutting out the bad stuff have been great – I almost never feel bloated, I never feel super hungry because I still get to eat throughout the day, I have more energy to work out harder, and I’m really noticing results from all those months at PureBarre! I’m stronger, my legs are leaner, my core is always active and I’m just a few more pounds away (hopefully) from a sculpted behind. For more healthy recipes, be sure to follow my “Healthy Eats” board on Pinterest! Thanks for sharing Merritt! You look gorgeous and your story is inspiring!!! I’m glad you shared this! As a regular blog reader, I feel like I learned more about you in this one post than I have in many. And it’s fun to know a little more! I never knew you worked at rS. I have also struggled with weight in the past and have found a rhythm that has worked for me. It’s nice to be able to find that healthy place, but it is hard. Congrats! Loving that you posted about something we all struggle with on a daily basis! It’s very hard to take that first step to living a cleaner life but once you do and start to feel and see the results, it’s all worth it! Thank you for the inspo and the recipes! I’ll have to try out your cauliflower marinara pasta which sounds beyond delicious! This is my favorite post of yours to date, mostly because from the outside, no one would know that you’ve struggled with your weight. I used to weigh close to 180 pounds (I’m 5’7″) and a few years ago, I made the decision to start taking better care of my body. It’s still something I work on each and every day. I’m extremely picky when it comes to foods, which makes it hard, but I’ve found what works for now and I’m going to keep trying new things to see if I suddenly like them ;) I’m getting back into running because I noticed a change in my body over the past couple of months and I don’t necessarily like what I see/how I’ve been feeling. I know that I’m my fittest self when I’m logging miles and doing my strength training and knowing other people are working toward their goals motivates me. I hope you have a fab holiday weekend! I know we’ve talked about this already, but I’m so glad you posted about it! I love making your cauliflower pasta but my guy think it smells super bad, so I’ll have to take advantage of him being away next week and whip it up a few times! ;) I also have been meaning to try cooking it on the BBQ instead of roasting! Will have to give some of thes other recipes a try! I am so glad you wrote a post about this and it hits so close to home! I (like you) ate whatever I wanted when I was younger since I was so active in sports and now that I’m out of college, I am desperately trying to get back into shape. You’re right about it finally clicking, I just sucked it up and started eating clean and working out and I am so amazed at how great I feel! Keep up the great work, Merritt, you look AWESOME! Thanks for sharing this – I really loved reading and thanks for the honesty. Just have to say – you have been looking HAPPIER than ever in your photos. Maybe related to you making these changes and feeling better overall. Long time reader – love your blog! Great job Merritt! You look great and I’m glad you finally found something that works for you. Making lifestyle changes are extremely difficult. I need to find my healthy eating plan. I love spin class but can’t let go off H. Dazs. I eat salads most days for lunch, but lack consistency with breakfast. Anyway, cheers to you. And no worries you’ll hit your goal real soon I’m sure. Happy Fourth of July. You look amazing and a clean diet + working out is really the only way to keep things in check!! I recently cut out 90% of the gluten in my diet and have noticed a HUGE difference. I am going to try your cauliflower pasta…sounds super delish! Thanks for sharing your story! GREAT post!!! Very brave of you to share your story. I’m proud of you!!!! Love this post Merritt. Thank you for being so honest and sharing your story! First off, GO YOU for cutting out all the bad junk foods. I’m trying to lose 5-7 lbs and this week is my carb/processed food/sugar free week. After watching fed up I’m hoping to cut sugar out for good, but I love the occasional scoop of ice cream. As for all your recipes I’m right there with ya, roasted veggies are my favorite! I love this post because it shows how open you are with your readers. Thank you for the recipes! I can’t wait to try them out soon! I’m a Dallas gal myself and would love to know your healthy restaurant recommendations. Thank you so much for the sweet words about the post/my blog! Let me know what you think about the recipes!! Some of my favorite restaurants for healthy lunches and dinners are La Duni (the pulled turkey salad and the rice salad with chicken are my faves), Origin (The Regular Salad – comes with warm brussel sprouts… so yum! ), The T Room at Forty Five Ten (Green Goddess salad), Mr Mesero (Del Corazon salad), DIVE (Kale salad), Hillstone (Kale salad and veggie burger). For dinner, I generally order some sort of fish or chicken dish – whatever looks most simply prepared with healthy sides like brussel sprouts or mixed vegetables. Hope that helps! I’ll let you know if I think of anything else!! Inspiring story! Many people think that loosing weight and maintaining a good looking body is something that starts and ends. The truth is it is a process, a way of life, that, if done correctly, brings joy and health in your life. Thanks for sharing your experience!